Before I made these cookie I really did not know what a fluffernutter was. Here is the truth, I am not the biggest marshmallow person. Okay wait, warm marshmallows with chocolate? Yes. Gooey, sticky, still warm Rice Krispie Treats with maybe a little chocolate mixed in? Yes. But just marshmallows alone? No. I can’t do it, it’s too sugary and too boring. And I always think, I would rather be eating something else. Also, up until a few months ago when I made these Toasted Coconut Caramel Peanut Butter Snickers Bars I had no idea marshmallow fluff even existed. I had never bought it before and I never had any growing up. My mom was strictly a chocolate cake, chocolate chip cookie, Special K Bars, peacan pie, chocolate chip cookie pie and the occasional Rice Krispie Treat kind of baker. Marshmallows were saved for S’mores and Rice Krispie Treats. Oh and sweet potato casserole on Thanksgiving! 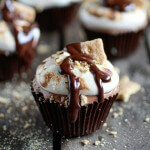 It was only once I started blogging that I realized there is about a million and one recipes out there calling for marshmallows and or marshmallow fluff. And I mean marshmallow frosting? Yeah, I definitely did not know that existed. And oh boy am I excited about it. I mean wasn’t it just two weeks ago that I posted these S’more Milk Chocolate Mousse filled Chocolate Cups with Marshmallow Frosting? Yeah, it was. I am like a kid with a new toy. Just swap the toy for marshmallow frosting. So I researched what the heck a fluffernutter sandwich was. Peanut butter and marshmallow fluff sandwiched between two pieces of bread. Sounds ok, but probably not my thing. So I kicked up the fluffernutter and added bananas and chocolate. Not sure if you can still call this a fluffernutter, but I’m going with it, and what ever you want to call it, it’s good!! They are pretty simple to make, but the tricky part is keeping the sandwiches from sliding to one side while the marshmallow filling dries. When the filling is wet, the top cookie wants to slide off. I found that if you line the cookies up in rows so that they are touching and all sitting up right, the cookies are all forced to stay in position and not slide. This way they stay aligned and pretty! Combine the flour, baking powder, baking soda and salt in a bowl. Set aside. In the bowl of a stand mixer (or use a hand held) cream together the butter, brown sugar and powdered sugar until light and fluffy, about 2 minutes. Add the peanut butter and egg and beat until smooth and combined. Add the mashed banana and vanilla, beating until smooth. Gradually beat in the flour mixture. Stir in the chocolate chips. Line two baking sheets with parchment paper or silpats. When the oven is preheated drop about two teaspoons dough onto the prepared baking sheets. Bake for 7 to 10 minutes and do not over cook. If anything undercook. Cool completely before filling. To make the filling, place the egg whites, sugar, and cream of tartar in the heatproof bowl of an electric mixer (or if you do not have a stand mixer use a regular heat proof bowl). Set over a saucepan with simmering water. Whisk constantly until sugar is dissolved and whites are warm to the touch, 4 minutes. 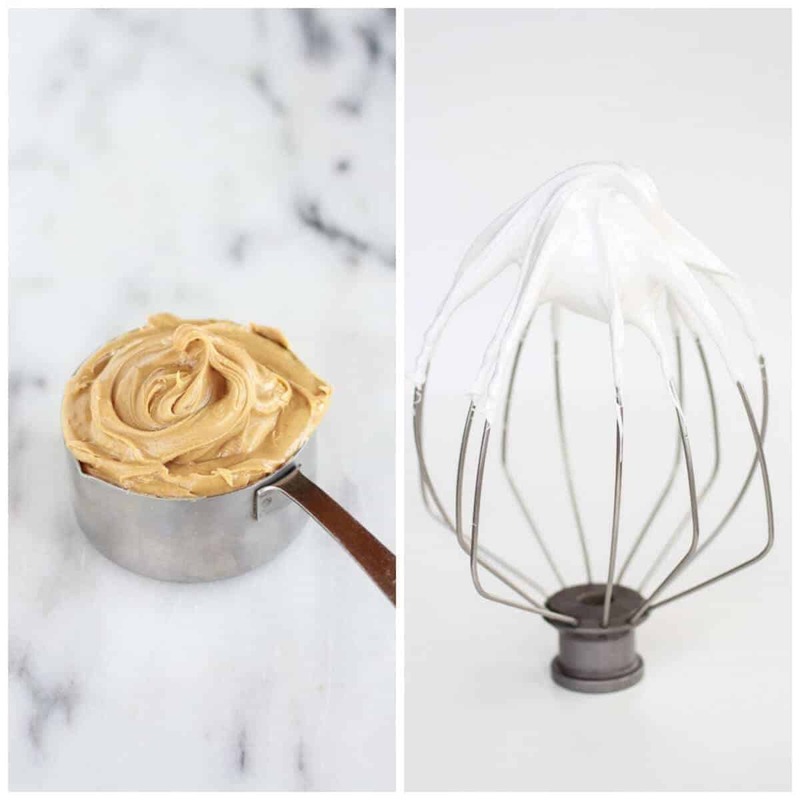 Transfer the bowl to stand mixer fitted with the whisk attachment, and beat, starting on low speed, gradually increasing to high, until stiff, glossy peaks form, 5 to 7 minutes. Add vanilla, and mix until combined. To fill the cookies flip half the cookies upside so the flat side is facing up. Spoon or pipe about 2 teaspoons of the marshmallow frosting onto all the cookies, leaving about 1/4 inch border. Wait 5 to 10 minutes and then top each cookie with it's other half. Line the cookies up in rows on a balking sheet and let the frosting set completely, about 1 hour. Try to tightly line the cookies up so that they are upright and strait. Some of my cookies wanted to slide to the side and I ended up with a few cookies that were crooked. Attention…The fluffernutter just got SO much better. 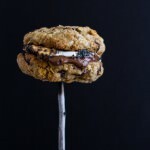 Oatmeal Chocolate Chip + Graham Cracker Cookie S’mores. 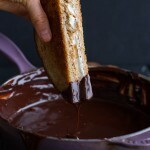 Toasted Fluffernutters with Cabernet Chocolate Fondue. I saw those cookies, they were incredible!! As always!! 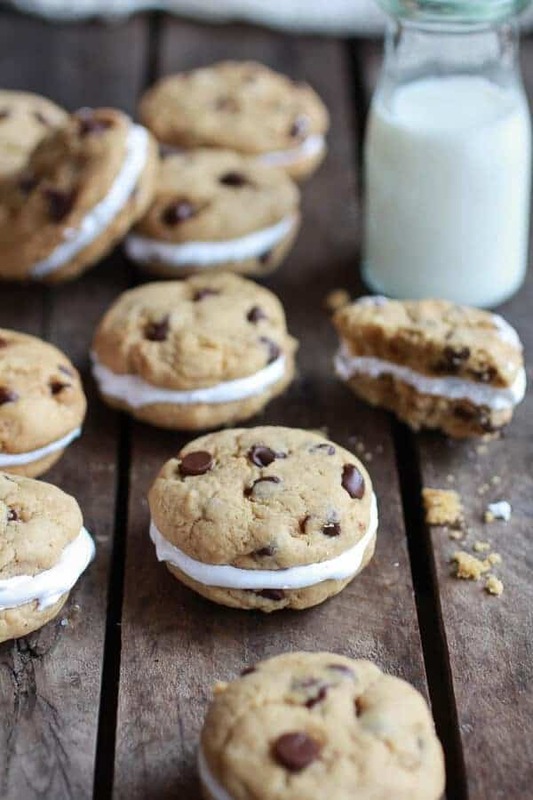 I’ve always wondered what to do with that marshmallow fluff stuff and now I know! 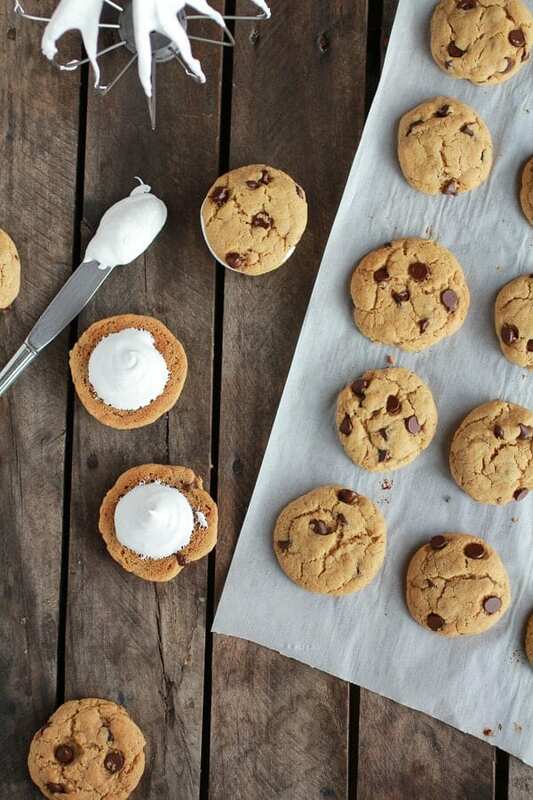 Love the idea of these cookies. Well thank you!! So happy you are liking my updated version! Thank you, Julie!! I cannot believe I have never had any fluffernutter themed foods until these cookies. I have been missing out! Love everything going on with these cookies!! Fluffernutters were my favorite sandwich growing up. 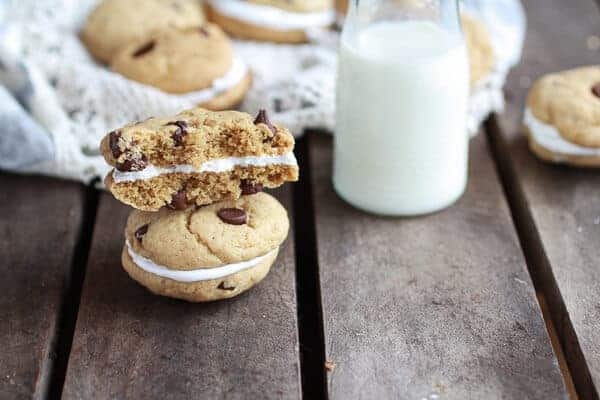 What am I saying…they are still my favorite 🙂 I love that you added banana and chocolate to this fun cookie! I want like 9 for breakfast!!! LOL! Thank you so much, Jocelyn! I cannot believe I have never had any fluffernutter themed foods until these cookies. I have been missing out! LOL! That means you must make them!! Can’t deprive ourselves, right?!? Thank you!! I totally agree, it’s a combo that can never go wrong! I grew up eating fluffernutters but have not introduced my kids to them yet. I am afraid once they start they will never want to stop!!! These cookies look wonderful! It’s a legit fear!! LOL! I sorta feel like I’ve been missing out this whole time—I really had no idea what a fluffernutter was either! And totally agree on the marshmallow thoughts, can’t really eat them plain, unless they are torched and with chocolate. My sugar tolerance is too low –> that sentence makes me feel old, haha. Yes, I am not alone!! Seriously, this is a relief!! People cannot believe I have never had a fluffernutter! Hehe! You think they would melt?? NO WAY!!! That is insane and so awesome! I want that cake! Awe, thank you so much! You are so sweet, Hannah! Oh. mygosh. I think this must be what they serve in heaven! oh my gosh! Thank you, Bridget!! That means so much coming from you!! Well I am SO glad you discovered the trueness of fluffernutter because HOLY YUM! Oh my gosh. You made your own fluff. That is amazing. I think I might have to scream. Either that, or make a batch of it, put it in an empty Miracle Whip container and eat it in public. Okay, not really. But seriously, that is. so. amazing. I love peanut butter + fluff sandwiches *guilty pleasure* But it’s been probably ten years since I’ve actually eaten one. haha! 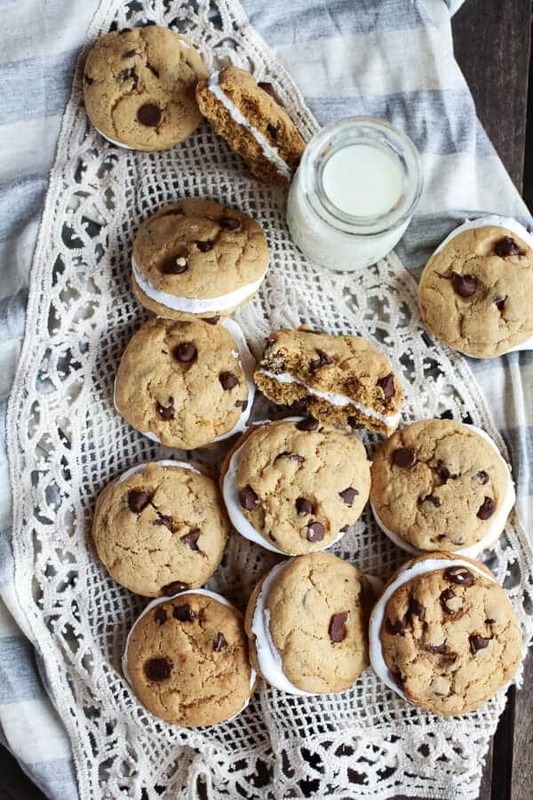 These cookie sandwiches look so much tastier and fun! I love the addition of chocolate. <3 perfecto. Haha! Thanks Abbie!! The marshmallow frosting is pretty good! 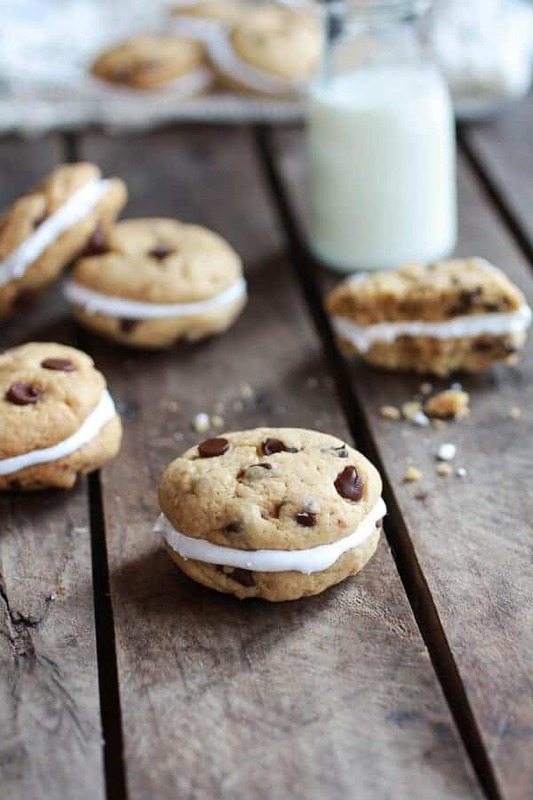 I adore sandwich cookies and the way you styled these – gorgeous light! Thank you so much, Laura! I kind of hated these photos, so I am happy you like them!! My light has been all funky lately! 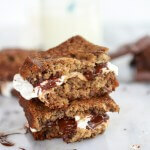 Bananas in cookies are delicious but add fluffernutter…holy moley. I don’t like marshmallows out of the bag but I love the marshmallow cream you have goin’ here. Thank you, cathy! I am not a marshmallows out of the bag person either! Now these are my dream cookies! I have never made a sandwich cookie, but they always look so good. Thank you, Kristi! 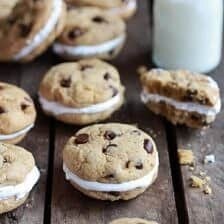 You have to make some sandwich cookies, they are so fun! These are mind blowing, Tieghan! I want a stack of twelve! Amazing recipe. Thank you!! Wish I could send you some, but I think they would melt in that Texas heat! LOL! I was the same way until these cookies. They are my very first fluffernutter!! I loved them!! I could eat at least 27 of these cookies!! HA!! Thank you, Julie! I cannot believe this was my first fluffernutter recipe!! Loved it! Thank you so much, Jennifer!! Kids do go crazy for them! I remember my classmates bringing fluffernutters to lunch when I was a kid, but my mom would never let me have them! PB+Fluff is a match made in heaven, but adding chocolate and bananas & chocolate brings it to a whole new level! Drool! I so agree! Thanks Allie! Thank you, Jocelyn! I of course hated the pic, so I am happy to hear you like them! 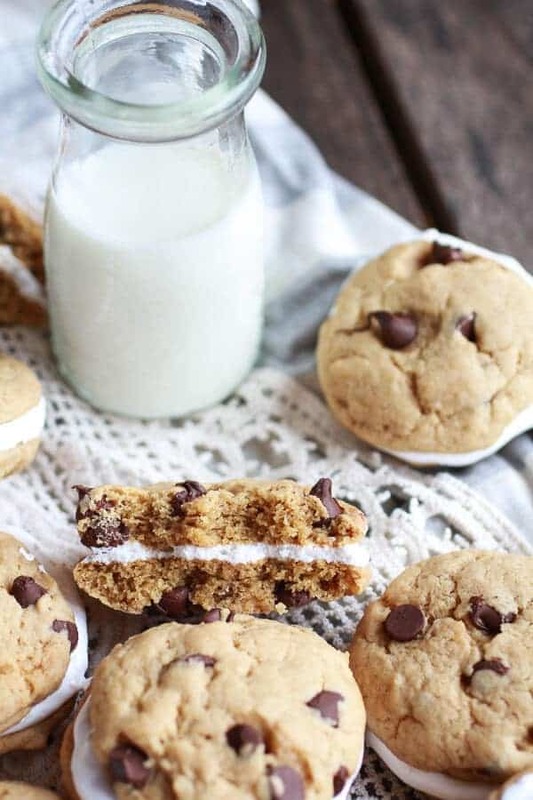 Hey Christina, I would use this chocolate chip cookie recipe (minus the filling) or the oatmeal chocolate chip cookies and then just sandwich the cookies as directed. Hope you guys love these!! Absolutely Amazingly Awesome cookies!!! I made these as a “Special Treat” for some friends that helped me move an outdoor playset into my back yard, and I believe they will have to be in my regular rotation of sweet offerings from now on…my family was upset that they “only got one”! Thank you for coming up with this brilliant combo! These babies are so damn good! Love this recipe!